Before a recent trip to Chicago I had seen an estate listing in Architectural Digest for a house in Lake Forest, Illinois that I was intrigued by. It stood out to me because it was white and English in style, both of which I have an affinity for. Having never been to (or even heard of) Lake Forrest, I did a little research and discovered that Lake Forest would be full of the classic architecture that I love. So, when I got to Chicago I made it a point to visit Lake Forest, a short trip north of the city. With some creative Googling I was able to find the house (sans address) I had seen in Architectural Digest. The house was interesting, but it looked better in print than it looked in person. All was not lost though. I discovered the house featured here while touring the general area. And what a house it is! The house is mostly hidden from the street, but I was able to catch enough of a glimpse driving by that I knew I had to stop and check it out. I thoroughly enjoy poking around construction sites, especially those of houses with architectural interest and integrity. While the house is quite large, no detail was overlooked and nothing felt out of scale as things often do with big houses. 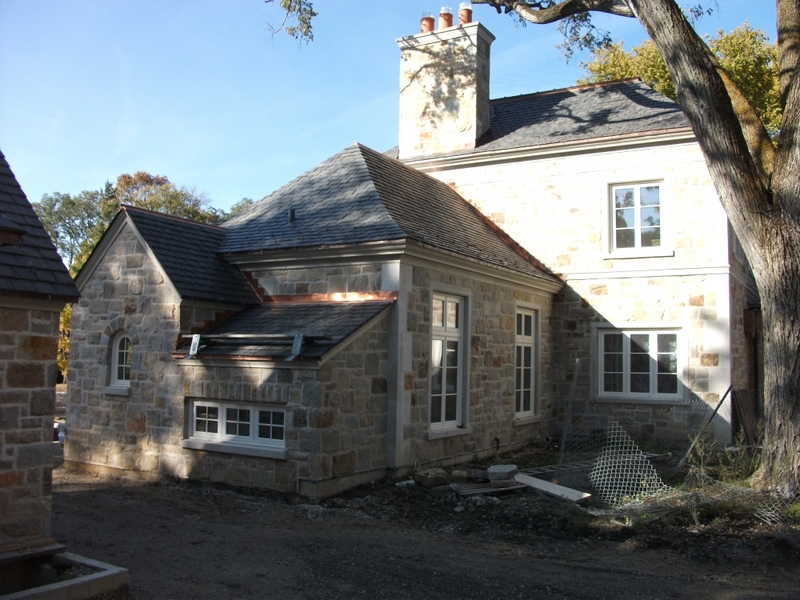 This house is built with only the finest materials: stone, limestone, slate, copper and steel windows. I've arranged the photos in this post in clockwise sequence so you can do the same walking tour that I did. 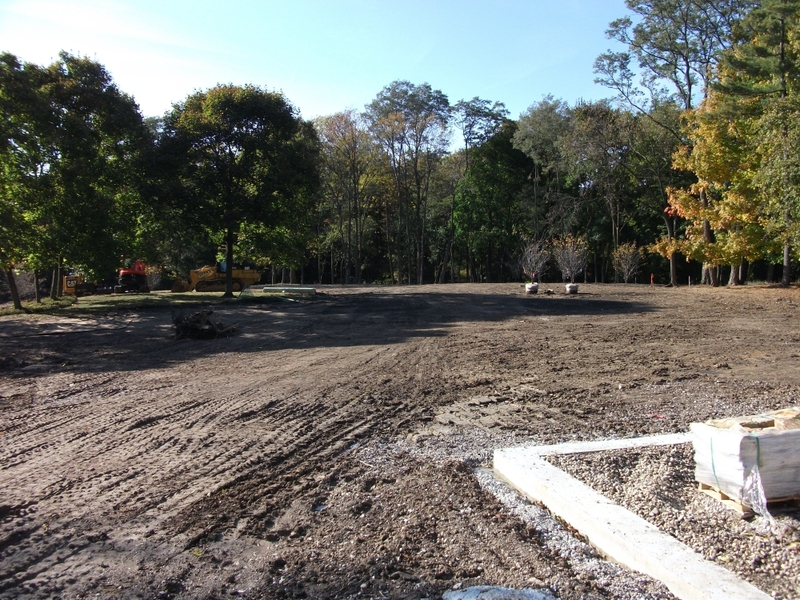 Getting started, you can see above that the front entrance had not been constructed yet. I'm imagining a limestone door surround must have been on the plan. Anything else wouldn't be right. 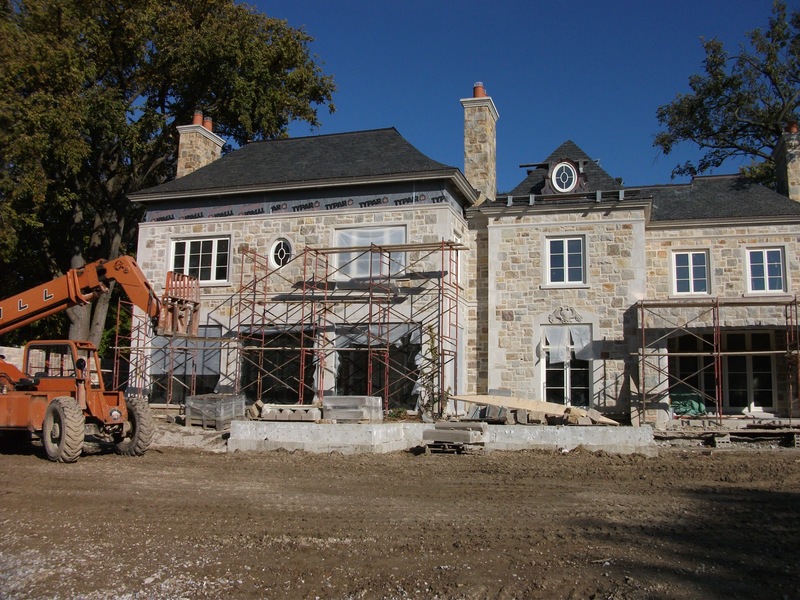 As we head to the left, the detail you immediately notice is how extensively limestone was used as an accent to the fieldstone facade. The window surrounds, the quoins, the X-motif in the railing and if you look closely, the horizontal banding. Given this blog's moniker, I'm sure it comes as no surprise how much I like all of the limestone. 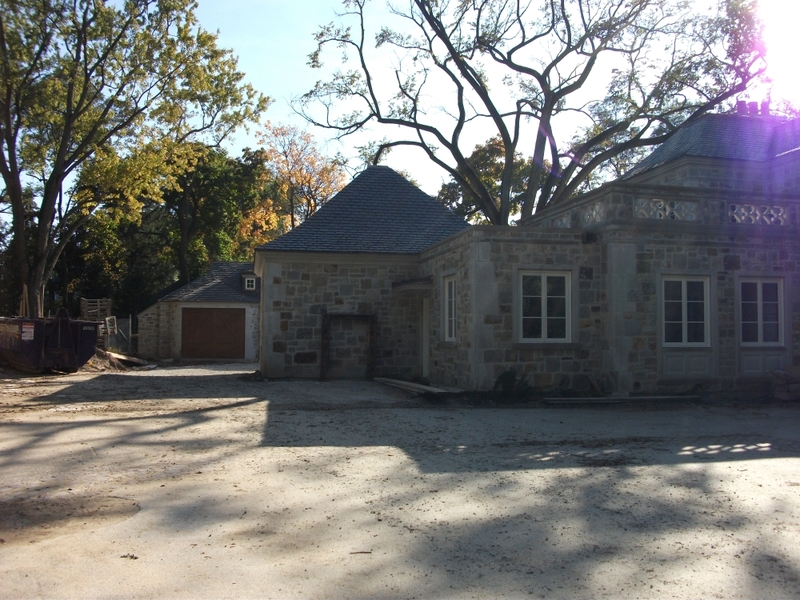 The portion of the structure with the hipped roof in the middle of the photo is a 2 car garage with an entrance on the other side. The structure on the left in the distance is an additional 3 car detached garage as you'll see in the next photo. Moving along you get a good glimpse of the detached garage. The single bay on the left of this picture is constructed as a small turret. I enjoyed the diminutive dormers and the polish they added to what is typically a utilitarian structure. No expense was being spared at this house. I'm not sure what the structure in the middle of this picture is. It's detached from the garage and the main house. Perhaps it's an office or chapel of sorts. If you click this photo to enlarge it, you can get a good glimpse at the beautiful slate roof. You can also see the interesting scale of the structure. The roofline comes down quite low. I find the scale to be intriguing. Almost like it's a playhouse for children and scaled down more to a smaller person. Jumping back to the slate roof, if you pay close attention, you'll notice the clean joints where the opposing sides come together. Typically there is a top cap used at the joint, but here the joints come together to form a sharp edge. I especially like that clean look and the effect it has on a roof's appearance. I have been told it's more expensive to construct that way. Here you can see that the main house's furthest most wing mirrors the scale of the structure we just looked at. I'm tall and could probably easily hop up on the roof at it's lowest point here. Looking at the small windows that are very close to the ground, I wonder if they are purely decorative or are low to perhaps let light into a stairwell leading to a basement. I didn't really think of that when I was at the house so I didn't investigate. Plus the house was locked so I couldn't venture inside. As we turn the corner, the rear facade begins to reveal itself. 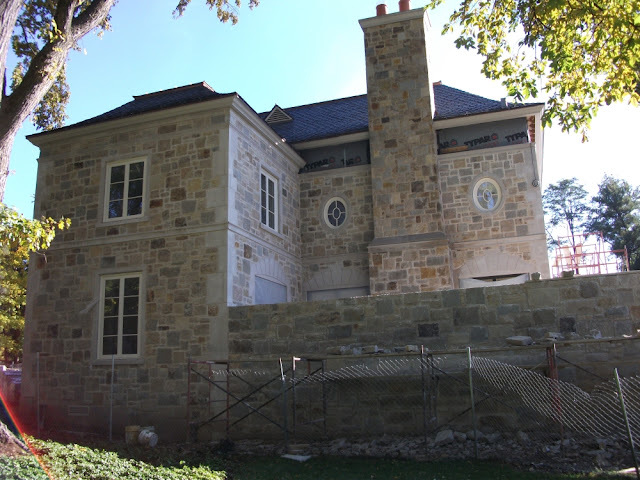 The back of the house was given as much or more attention to detail as the front. 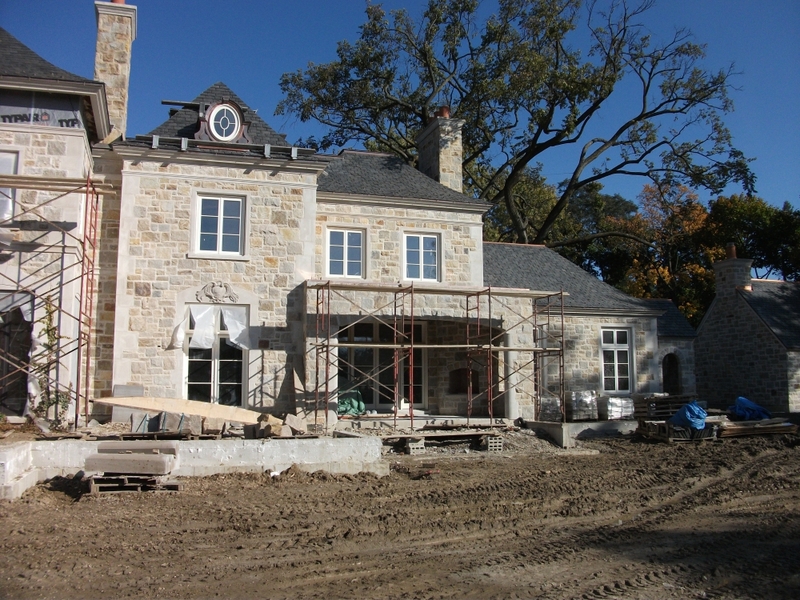 Notice that the limestone accents weren't reserved for just the front of the house as they so often are to save money. 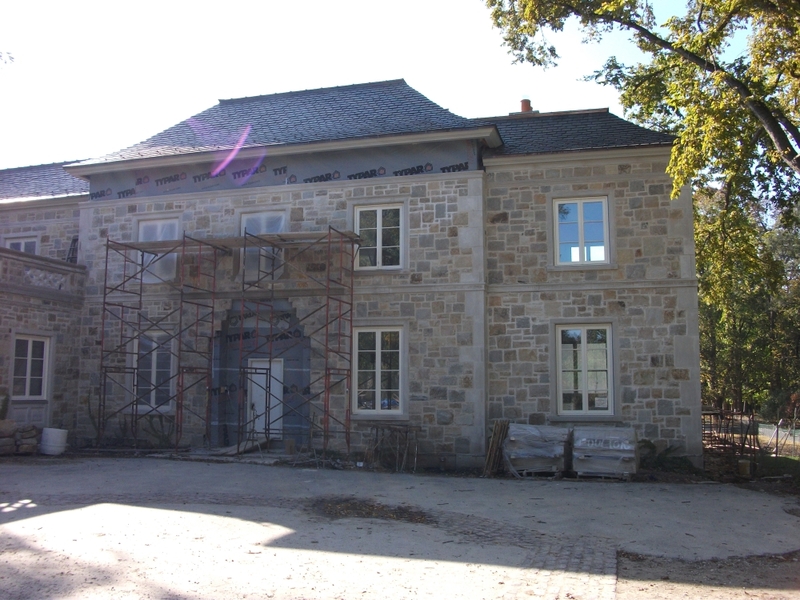 A better view of the back of the house begins to show my personal favorite detail: the decorative limestone window surrounds. Enlarge the photo by clicking on it to see the intricate detail of the surround in the center of this picture. Here you can see the rest of the rear facade. The 3 windows behind the scaffolding are steel, another personal favorite. A close up picture reveals the contemporary look of the steel windows. 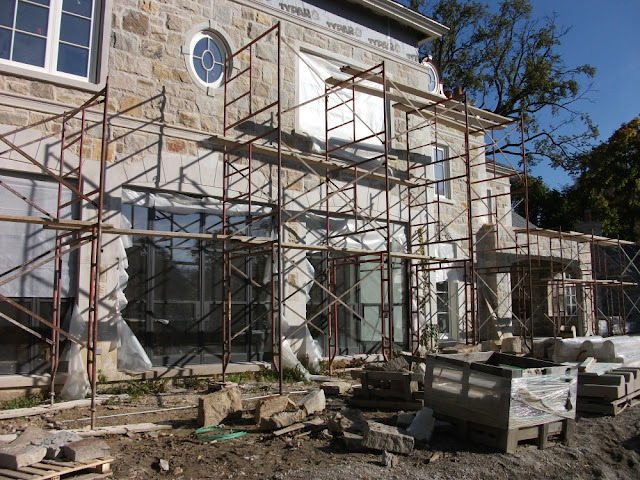 Look carefully and you'll see the beautiful detailing of the limestone surrounding the steel windows and doors. Perfection. 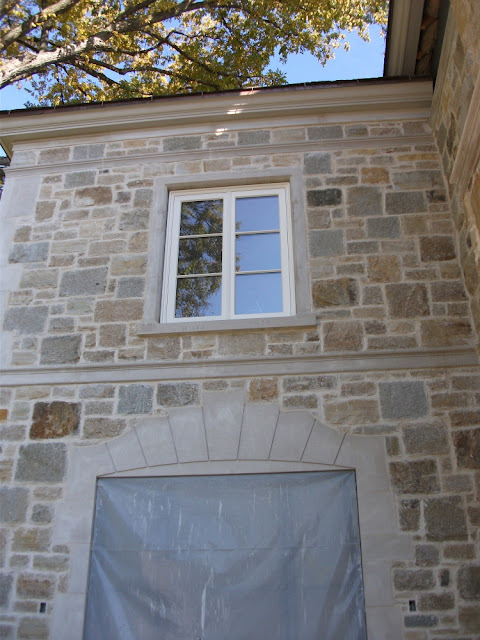 As we start to make our way back around to the front of the house, you can see the interesting window surround detail was applied on the side of the house too. I don't recall what the area on the inside of the large wall was. It was still under construction obviously, but I'm thinking some sort of patio now. I just had to show a close up of one of the limestone window surrounds. I was so mesmerized by them. 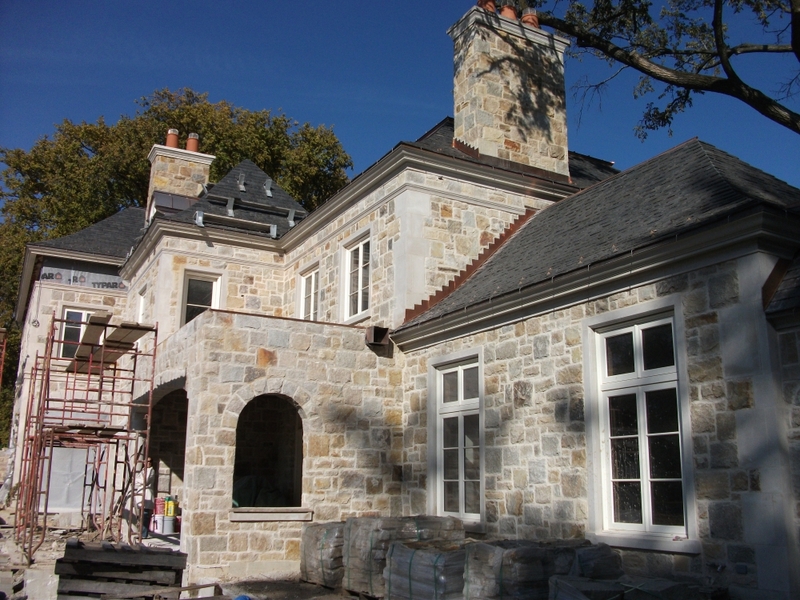 I especially like that the surrounds are flush with the fieldstone facade. Nice and clean, a tailored appearance. This photo also affords a good view of the horizontal banding. I was quite enamored with that too. I like the way it breaks up a large facade and makes things feel not so overwhelming. 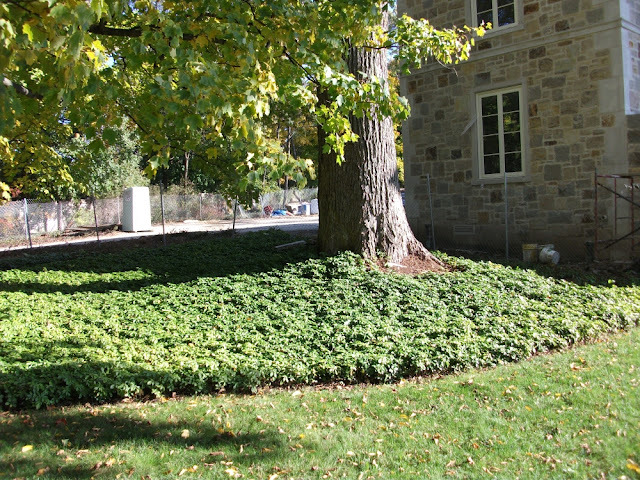 I also couldn't help but include this photo of a large swath of pachysandra (another favorite) that is presumably original to the property. I'm glad the team building the house recognized the beauty of the existing landscape and preserved it instead of just clearing everything away and starting over out of convenience. I'll conclude the walking tour with a view from the house into the backyard. As you can see, it's quite a large lot - 3 acres or more I'd guess. I can envision a beautiful pool going in with lush landscaping surrounding it. Amazing. I'll have to schedule another trip to Chicago just so I can see how the house came out. I'm especially curious about the front door and surround. I have a penchant for limestone door surrounds and have to think that something very tasteful was selected to compliment the rest of the house. I hope you enjoyed the tour. I've had this house in mind for a post for some time, but am just now getting time to put it together. Despite my lack of posts lately I've really had architecture and design on the brain alot. My excitement for houses never seems to wane. UPDATE: See the 5th comment down by Anonymous for some history on the house. It turns out that this isn't a completely new build and the original house had pedigree. ** Don't forget that you can click the photos to enlarge them. Most of the photos I include in my posts are much larger in size than they are displayed in the post. Thanks for the tour. Certainly doesn't look new - a good thing. 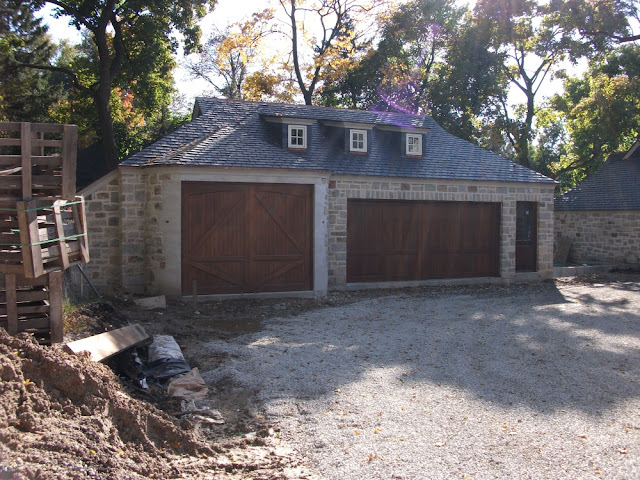 The garage and outbuilding look like they've been added over time as the family made it way though generations. They help ground the house even though they aren't attached. I like the bands too particularly the one at the top. Very crisp looking. It's rare to find that much flat land in most of Atlanta. Hard to get that look here. A house at street level has a look all it's own. Loved this post - what a pity you don't post more often! In Europe we never see new builds of this design and quality, the detail is amazing, and I should imagine so is the cost. What an amazing home and thank you for taking us along on your tour. Stone, steel, limestone, what's not to love? And the copper detailing, they're going to love how fast that patina's down.At first glance it seems like a large house but after looking at the pictures more maybe not as huge as I first thought.It's a very warm and inviting home to bad we'll never get to see the inside with that kind of detail out the inside is going to be fabulous! We've designed a few homes in the Lake Forrest area. It's a beautiful part of Chicago. Glad you discovered it! I know this house well. There is actually an original house underneath it! This is a kind of resurfacing with many additions and out buildings. 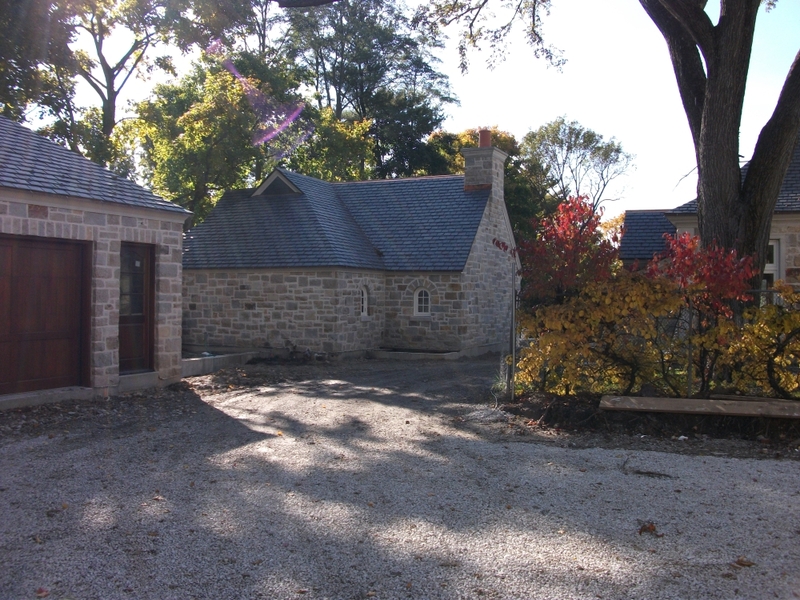 The original house was lime washed brick also french, built in the 1960s. It had a flat roof, it was very clean and crisp more Directoire or Louis XVl. The original architect was Stanley Anderson. I cannot remember the name of the people who built it but it was very pretty inside, very Billy Baldwin Palm Beach esque. I grew up down the street. Beautiful.....love all the limestone detail and have a full appreciation for it now that we are in the throes of putting the limestone on our own home. Its a painstaking, labor intensive and costly project but boy does it pay back in spades for decades and decades of admiration. This is beautifully done, love the stone work too. Would love to see it as it moves along....thanks for sharing. Please stop by to see my first giveaway, a french chair! What a beautiful home. You are so lucky that you are able to go check out these homes in person through your travels. Thanks for sharing them all with us! What an amazing home and I love the details. Part of it's appeal to me is its position on the lot, with a lot that looks proportioned to the home. I've heard of Lake Forest and will have to put it on the list for a visit (with camera) the next time I'm in that part of the nation. I love that the house is not new - but has history! What a fun story. Thanks for the great pictures. I too never tire of looking at houses - might we have a house addiction? your posts are worth the wait, James. what a great house, Lake Forest is a beautiful town. Stunning post! Love your blog, just found you and looking forward to following you! Very picturesque but I might have been reluctant to lose the original Directoire style house and want to improve it instead. I wish them luck on the slate roof without the ridge caps; I have never seen that detail last more than five years or so without leaking. They are really gambling in a snowy climate. Despite that, the overall design is carefully considered. It reminds me of those new houses by the office of Robert A.M. Stern, or Eric Smith, both of NYC. Thanks for the comments everyone. I'm already working on another post that I hope to share soon. Thanks James, and you've been missed! Nice photos. I like your blog. New follower, in fact. Looking forward to what's ahead. What a great house. Oh how I would love to see the inside too! What a wonderful post. The home is absolutely gorgeous, every detail! You really should title your posts though as the name of your blog shows up in Google Reader as "(title unknown)" rather than Limestone and Boxwoods. Beautiful. Looks like it will remain for centuries. Found your blog from doing a pool search. Loved your pool post from March of last year. Love everything else I see as well. Totally up my alley! Beautiful, almost european. I suppose it was inspired by some Belgian examples, like Frank Missotten, Domus Aurea, Vlassak Verhulst, who build for the wealthy in Flanders. I came over from the Entertaining House and had to stop by when I saw Lake Forest in your post title. It is such a beautiful town with gorgeous homes and an adorable downtown area known as Market Square. I love driving by all the estates by the lake, soaking up all the beautiful details in each home. My collegues are on their way to Chicago for the Antiques show at Merch Mart - and do wish I was along so I could take a little tour as you did! Great architecture!Looks like it will last longer..like centuries!Magnificent Post!Love your site. looks like my kind of house! Love the stone work, the wood-the garages all of it. Thanks for sharing such inspiration..
Great house! I've been up on the North Side of Chicago several times. What a beautiful area. Wonderfull house, I hope you'll come with an update. I, along with all your other admirers, await your next post. You feel like a distant relative whom one is always glad to see. Just stumbled onto your blog! I am really smitten with you style! I am for sure becoming a new follower...be back soon for more xoxo! Thank you for the tour! What a beautiful house. I particularily like the stone work. 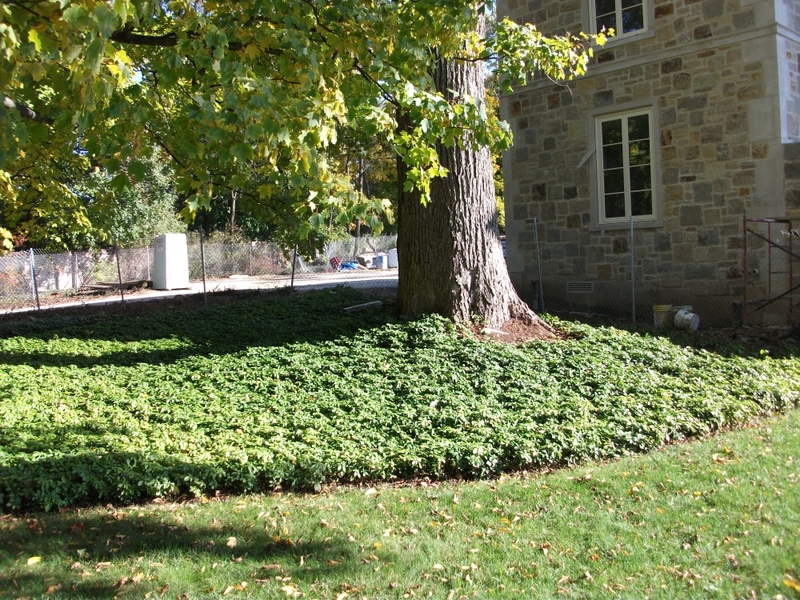 The original house was built for Sewall Gardner - is whats underneath this house. (see link for photos) I guess one would call it " Regency" not Directoire.